City Music Schools drum lessons are conducted in our dedicated teaching studios, based in Thurcroft, Rotherham. We offer 30 minute or 60 minute 1 to 1 lesson slots for everyone, from beginner to advanced and all ages. All our studios have excellent equipment, in fact we provide everything you need, from drums to sound equipment, for you to progress quickly, play to tracks and enjoy every aspect of your lessons. Our teachers are all in demand players within the music industry. They have a wealth of knowledge and experience and love sharing their passion for drumming with our students. Playing drums is an art form. In your lessons you will learn many drumming techniques and concepts to enable you to play in many styles. 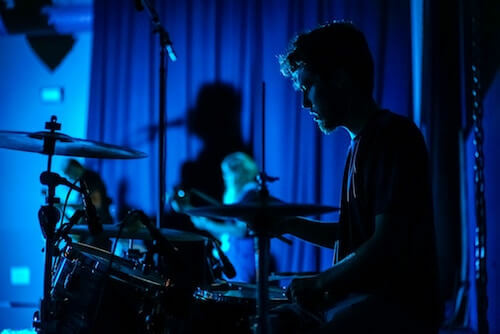 If you want to concentrate on a specific style of drumming or just want to work on certain aspects of your playing, we will structure your lessons to your particular goals. For those of you who want to gain qualifications, you have come to the right place! We congratulate the 100’s of students past and present, who have helped us maintain our 100% pass rate at all grade levels over many years. We teach the Rockschool accredited grades syllabus. UCAS points can be acquired in grades 6-8 and this has helped many of our students gain access to degree courses at their chosen university. It’s easy to book your music lessons or get your questions answered first Call 0798 889 8322 or send us a message. In addition to our 1 to 1 lessons, we offer Classes and workshops such as, Hand Technique/Rudiment classes and our very popular ‘City School of Rock’ classes. Here you will experience the joy of making music with other musicians from our school, preparing you for the world wide stage! Our mission is to help all of you reach your full potential and enable you to become the drummer you want to be.